Our wide catalog of frozen French fries and our Typical Tapas product range played the front line role in our stand at the event organized by Aniofe Group in which the distribution company showed its customers, most of them from hotel trade and catering professionals, a wide range of premium meats and gourmet products. Part of the Eurofrits-Aviko team travelled to Ibiza to show the latest product developments. The event took place at the newly renovated facilities of Aniofe Group. Under the name of “Attraction Meat” the event brought together ten food brands distributed by this Balearic company and featured shows and tasting of its different products. 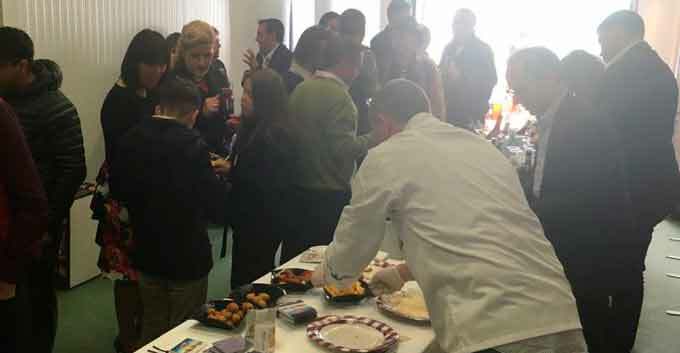 The aim of the event was to offer, in a single area, the chance to taste some of the high quality products offered in the main restaurants of the island, enjoy an entertaining working day and encourage the exchange of contacts. Eurofrits-Aviko team exhibited a selection of products from our catalog of Potato Specialties within a wide variety of fries of different cuts (classic, julienne, steak house) as well as potato specialties (dollar, wedge, parisienne, etc.) or the latest products as Turbo fries, ready in 90 seconds, or Super Crunch, extra crunchy. The PREMIUM potatoes Supercrunch were the best received by the attendees. The specialities of our Typical Tapas range played a special role. The new chicken specialities recently added to our catalog were exhibited there: Chicken sirloin in Cajun flavour, natural and exotic equally shared, Chicken breast pieces in Cajun flavour, made of chicken breast pieces, coated in cajun-spiced flavour crumbs, pre-fried and deep frozen, Chicken Breast Pieces, chicken breast pieces, coated in crumbs, pre-fried and deep frozen. The Raclette cream snack, small balls of intense flavour with raclette cheese, coated in a crispy and spicy breadcrumbs, prefried and deep frozen. Visitors were also surprised by our latest snacks: Philadelphia® Crispy Snacks, a crispy and creamy product, perfect as appetizer as well as a ready to take-away in paper cones. Our products were extremely successful in a trade fair organized by Aniofe Group, a leading company in the sector with almost a hundred of employees and more than 3,500 references.